The uncouth PC market is awash with cheap Skype phones. These connect directly with the Skype software, enable you to see which contacts are online, and then call them. However, the choice has been limited for the Mac - at least with phones that properly interact with Skype in the way we've just described. Enter Keyspan: a maker of Mac peripherals, including iPod docks and presentation controls. 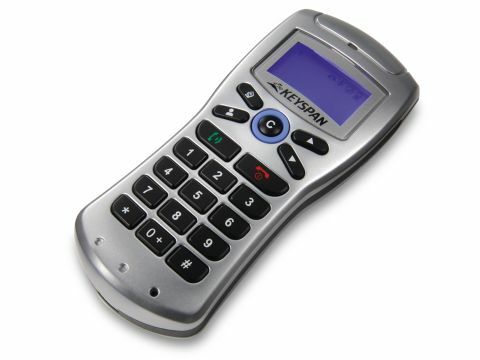 The compact phone is quite thirsty, with three (included) AAA batteries required for power, which makes it weightier than many cordless home phones. However, the batteries are rechargeable, and you can keep the phone topped up by charging it via USB. There's a USB cable included, though the phone takes any standard Mini USB cable. The Skype software isn't included on the disc, so you'll need to download it from www.skype.com. The box includes a simple USB dongle. All we had to do was plug it in, press its button, and it immediately found and paired with the phone. Once you start Skype and sign in, it will ask if you want to use the new phone with the app, otherwise the software will sit in the background. The driver software isn't universal binary, so will run on an Intel Mac under Rosetta. The basic dot-matrix interface of the phone takes a bit of getting used to, but once you have the hang of selecting contacts, operation is simple. This phone has one major problem: its price. At £70 it's far more expensive than, say, a headset with microphone and headphone jacks. Yes, it might be the more convenient option, but despite the simple set-up, the phone has the feel of kit costing half the price. And yes, the maker may have gone to town in ensuring that it's fully Mac compatible, but unless you plan to use Skype continuously, you'll probably feel that it's an expense too far.